Summary: Lightly spicy with seasonal Hatch chiles, this classic margarita has a bit of a bite and ends with a smile. 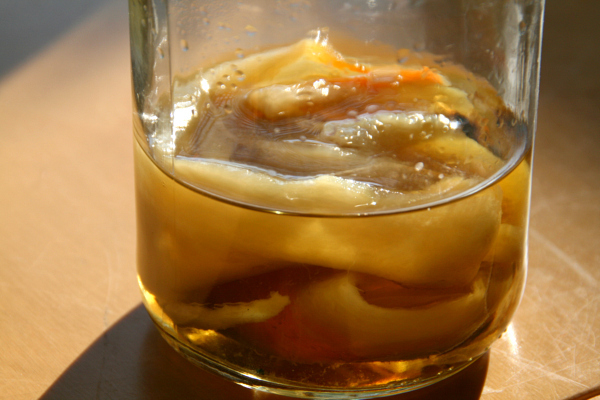 Make the Hatch tequila a week ahead. 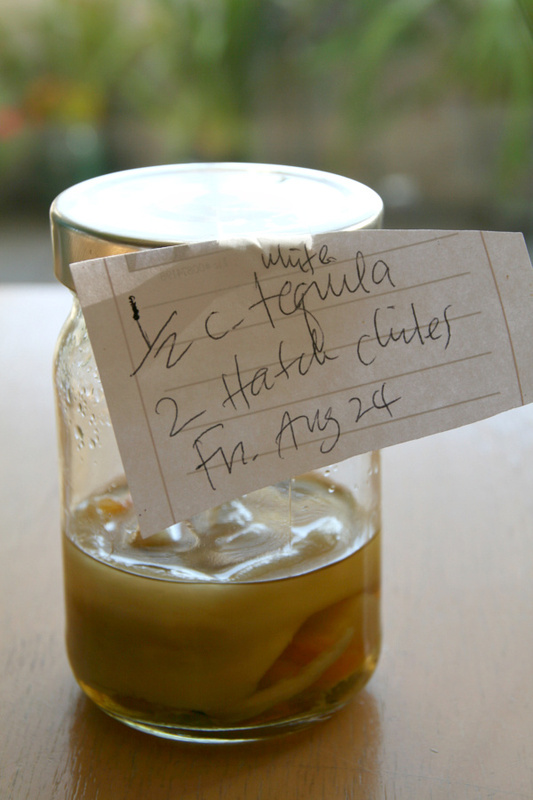 For Hatch Tequila: Add chiles and tequila to a small jar with a lid. Close tightly and put in a dark pantry for at least 5 days (can be longer). After 5 days, it is ready to use. (You can keep it much longer.) You will note that the chiles have given up some of their color to the tequila. Be sure to label the jar so you know what it is later. For Hatch Chile Margarita: Combine tequila, Hatch tequila, Cointreau and lemon juice in a glass. Stir and add crushed ice. Note: Chileheads might like 1 tablespoon Hatch tequila instead of 2 teaspoons. You decide if you are a chilehead or not. Garnish with a strip of Hatch chile, threaded onto a toothpick or drink pick, if you like. Lemon juice, not lime juice? Margarita expert Al Lucero, who owns the renown Maria’s Restaurant in Santa Fe, NM, and has written “The Great Margarita Book,” and “Maria’s Real Margarita Book,” prefers lemon juice in his margaritas. Good enough for me! Also, see my award-winning Basilrita  for another variation on this delicious theme. I am bringing this zesty cocktail to our #SundaySupper Mexican Fiesta virtual potluck — a weekly group of foodies who band together to encourage families to eat dinner around the family table each Sunday. You can see what else I have made during my participation in #SundaySupper right here . Join us this week as we hope to inspire you with these mouthwatering recipes from our talented contributors. We will be sharing them all day long and invite you to share your favorite Mexican recipes during our #SundaySupper live chat on Twitter at 7 p.m. (EST). Chunky Aztec Chocolate Granola  - What Smells So Good? Please be sure you join us on Twitter throughout the day today, Sept. 16, during #SundaySupper. We’ll be meeting up at 7 p.m. EST for our weekly #SundaySupper live chat where we’ll talk about our favorite recipes for a Mexican Fiesta! All you have to do is follow the #SundaySupper hashtag , or you can follow us through TweetChat. Melissa’s Produce supplied the Hatch chiles for recipe development.